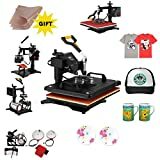 This is a clamshell heat press that comes with a simple skeletal design that includes two heated plates, a manual pump arm, and a digital temperature control. The rosin press is created to extract cannabis concentrate from raw cannabis. The rosin press is designed, manufactured and tested by Tuopuke, a U.S.-based popular manufacturer of rosin presses of very high quality. 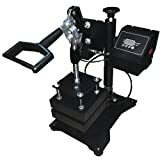 This clamshell heat rosin press is made from high-grade stain-resistant materials. Its high-quality components will make sure that the rosin press has an increased resistance, durability and an overall lifespan. 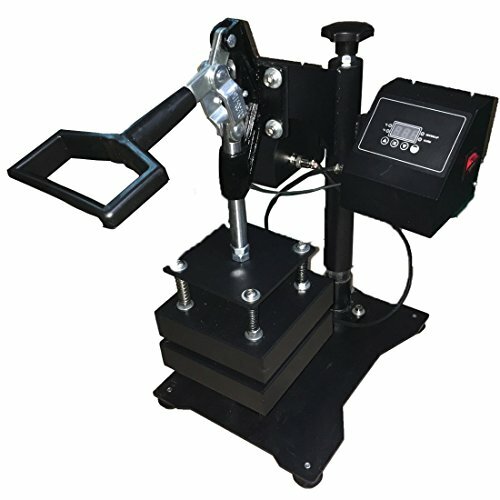 This rosin press weighs about 33.8 pounds, and it is a bit lighter compared to other models available on the market. Due to its lighter weight, the machine is portable enough to be carried and moved around easily. The smash plates measure five by five inches, and they are both coated with a non-stick material. This feature comes quite in hand because the slow-flowing cannabis extract can usually stain the plates really easily and a non-stick material can prevent this from happening. Both plates are heated, and the temperature can be carefully regulated with the help of the digital temperature controller from the machine’s control box. The temperature range of these plates is situated between 1 to 415 degrees Fahrenheit. The Quick Clamps comes with an electronic digital timer that will turn out very useful. It will successfully help you make sure that the cannabis materials will not stay longer than it’s recommended between the clamped plates. If the material remains longer than necessary, it will get burned. The time control indicates when a set press cycle is finished, and the final product is made. The power levels of the Quick Clamps machine are exquisite. The rosin press can generate pressures of around 1200 PSI, and this is a lot considering the machine’s dimensions. After this black-colored extractor machine arrived at my place, I was surprised to see that it’s not that heavy and I was able to move and carry it by myself. 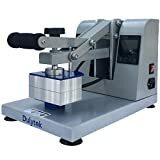 It turned out to be even lighter than other rosin presses I have worked with before, and I loved the fact that it’s so portable. Its compact design allowed me to use it as a tabletop cannabis oil extractor. I also liked the fact that the Quick Clamps came with square press plates that are coated with a non-stick material because this really helps protect the plates from stains from the cannabis extract. With the help of the timer that is included in the machine, I was able to make sure that the cannabis materials don’t stay too long between the clamped press plates and this way I never burned my material while using this press. It happened to me a while ago when I was still using my old rosin press, and it wasn’t too great to see all my work ruined by a pair of smash plates that burned my whole material. Usually, the cannabis oil flows poorly on square plates, and it can solidify while the press plates are clamped. This is the exact reason for which this automatic digital timer engages a release mechanism that disengages the clamps. The result is the fact that the bottom press plate can descend and nothing bad happens with the final product and with the plates as well. 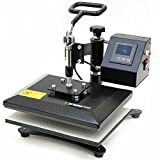 This rosin press is designed to work with 110-120 Volts power sources, and the power levels are also okay, and I was delighted with the fact that it can generate pressures of up to 1200 PSI. Another important thing you should know is that you have to place the raw cannabis inside a parchment paper because this will allow the particulate-free oil to flow from the pressed cannabis. You will see that the yield of cannabis oil depends on how long the pressed cannabis is held in place under high pressure between the press plates. For me, usually, 60 to 90 seconds is quite enough time. 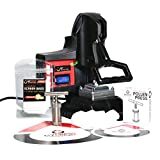 I didn’t experience any troubles while using this rosin press, so I can say that overall I am satisfied with it and I would definitely recommend it to any enthusiast. The Quick Clamps machine is effortless to use, and the instructions that come together with it are incredibly detailed and helpful. You can operate the rosin press manually as well with the arm pump that is included in the package. The digital temperature control is extremely helpful because it allows you to customize temperature levels easily according to each material that you are using. The rosin press comes in a scratch resistant material and backed-on paint. The high-quality materials used for manufacturing the rosin press will assure a long lifespan for this machine. The Quick Clamps machine is also effortless to maintain. 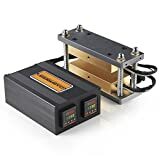 You will know when the heat press cycle is complete with the help of the included electronic time control to prevent burning your cannabis materials. I had to tighten some loose elements after the package arrived at my place, but other than that I couldn’t find anything wrong while using this rosin press. The Tuopuke Quick Clamps rosin press is made with very high-quality materials and Tuopuke also provides after-sales services. For more information regarding the product’s warranty, you are advised to contact the manufacturer directly. All the necessary addresses are provided in the product’s box, and you will easily be able to reach the manufacturer if it’s necessary. Even if the Tuopuke Quick Clamps features quite a simple skeletal design, it manages to do its job flawlessly, and you’ll learn how to use it in no time. The instructions that come included with it will turn out very helpful, and you’ll be able to extract very high-quality cannabis concentrate with the help of this machine.